SIRS, sepsis, severe sepsis, septic shock is a continuum, a crescendo of signs and symptoms associated with an infection uncontrolled by host responses. An avalanche or cascade of seemingly unstoppable events occurs often in a matter of hours which has defied causal intervention but for which symptomatic treatment has improved the outcomes over the years, significantly reducing mortality. This time-honored classification, introduced in the early 90s by Roger Bone et al , created artificial separation lines in a process which has no distinctive qualitative steps. But lacking better alternatives we stick with what we have: after all, there seemed to be a step-wise increase in mortality based on the number of SIRS criteria in earlier epidemiologic studies. While this classification scheme was of some use in academic discussions, it certainly has not done well in the clinical arena. Not a single sepsis trial has shown efficacy in confirmatory trials. In particular, mortality rates were not reproducible on repeat testing in patient populations selected with great care despite identical sepsis definitions. 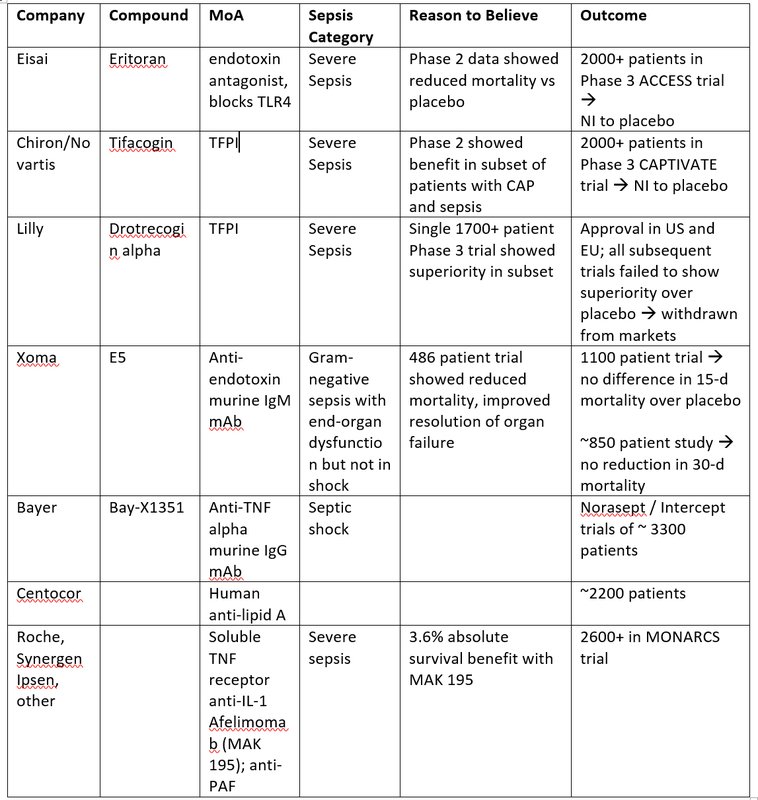 Sadly, the list of failed sepsis drugs is a very long one: It all started with HA-1A, then came E5, the anti-TNF mAbs, Xigris, tifacogin, steroids, up to the latest disappointment, E5564 (eritoran) from Eisai. All were tested in the more advanced sepsis categories using the staging originally defined by Bone et al. All were well-designed large trials; the argument that some were underpowered is not the issue here. Alas, they all failed for one reason or another. We can blame the drugs for a lack of efficacy but it may well be that the entity called ‘sepsis’ or sepsis syndrome’ was not defining a succinct clinical and pathophysiological entity. It seems more that we were developing precision medicines for an imprecisely defined condition, or a spectrum of conditions. It is reminiscent of the shotgun approach to treating any infection with antibacterials even when viruses are the culprit for most cases. A recent publication by Kaukonen provides further arguments that some components of the severe sepsis definitions are not prognostically meaningful . Contrary to earlier data, the presence of 2 or more SIRS criteria did not result in worse outcomes than the presence of only 1-2. Okay, nice to know but fairly irrelevant in the bigger scheme of things. No doubt, the next committee will dutifully adjust the severe sepsis criteria based on this insight. The change is unlikely to affect the conduct of studies for antibiotics or blockers of the inflammatory cascade. Too much in the sepsis vocabulary has become game of semantics: when do you call a brook a creek, and when does a river become a stream? Does it really matter and advance the field? It feels like moving gravestones around in the cemetery, to paraphrase the old adage. On a positive note, it is good to see how mortality in severe sepsis has been reduced and almost cut in half in the ICU over the years with symptomatic supportive interventions alone. A big “Thank you” to our intensivist colleagues is in order. L Napoletano. Sepsis and the Syndrome of Multiple Organ Failure. In: Modern Surgical Care: Physiologic Foundations and Clinical Applications. Ed. T. Miller, CRC Press 2006 – very good review of all aspects of sepsis and review of the older sepsis studies. This entry was posted in Recent Literature, The News, The Viewpoint and tagged afelimomab, Allphase Pharma Consulting, anti-IL-1, anti-PAF, anti-TNF mAb, antibiotic blog, Bayer, Bone criteria, Centocor, Chiron, drotrecogin, E5, Eisai, endotoxin, HA-1A, Harald Reinhart, ICU mortality, Ipsen, MAP 195, Novartis, Roche, sepsis, sepsis syndrome, septic shock, severe sepsis, SIRS, SIRS criteria, steroids, Synergen, TFPI, Tifacogin, Xigris, Xoma by Harald. Bookmark the permalink.